People would undertake a pilgrimage for many different reasons. The motivation for most would be a combination of three closely interrelated reasons. Firstly, people desired to see and touch places and objects that were considered holy. This might involve travelling to view places associated with Jesus or it might be to view relics of a favourite saint. The purpose of this pilgrimage was to attempt to make the object of faith more real. Secondly, people visited holy sites to make amends for having committed sin. By doing a pilgrimage as a penance, they hoped for forgiveness. These pilgrimages might have been for private reasons or for public reasons. They may have been voluntary or they may have been forced. Finally, people went on a pilgrimage for the simple pleasure of travelling. In a world that offered precious few opportunities to experience the world beyond the horizon, pilgrimage was an exciting, challenging opportunity to leave village life behind. The desire to make the Christian faith more 'real', is something that all pilgrimages shared in common. 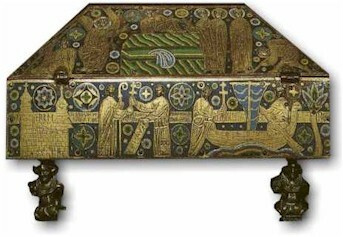 To actually be in the presence of something 'holy'; to see, or better still, touch something connected to a 'holy' event (the site of a miracle or the relic of a saint for example) made the believing much easier. The pagan religions that existed before the Christian conversion, had 'God' existing in natural physical objects that could be seen and touched: trees, rocks, water etc. (pantheism) In a sense, pilgrimage satisfied this traditional desire. 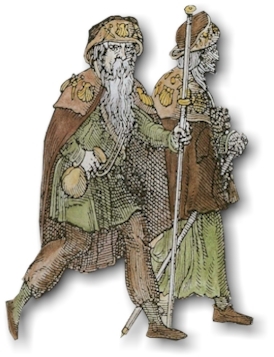 The concept of penance is central to pilgrimage in the Middle Ages. If you do something wrong in the eyes of God you commit sin. In order to be forgiven and to avoid going to Hell, you must confess your sins and do a penance. Undertaking a pilgrimage as a penance would be compulsory and where you went would be decided for you. The more serious the sin, the further away you were sent. In Languedoc in France, pilgrimages were classified as minor, major or overseas. 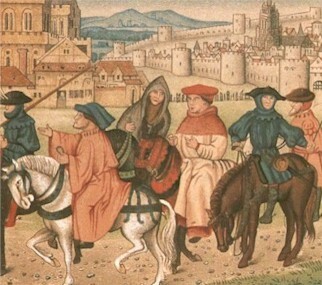 From the 13th century, pilgrimage was also used as a punishment for crimes, particularly for scandalous crimes by the powerful and famous. Pilgrimages imposed by the law are called judicial pilgrimages. They were quite convenient, because the community got rid of the criminal without the cost of imprisonment. 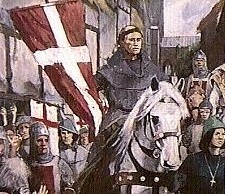 In 1319, Roger de Bonito was sent to Rome, Santiago and Jerusalem for the murder of a bishop. If you committed murder, it was common to have the murder weapon hung around your neck throughout the pilgrimage. If you were guilty of heresy, you might be expected to wear two yellow crosses on your front and back. As a consequence, you were not treated like other pilgrims but instead would be publicly humiliated. You would also be expected to collect signatures at all the shrines you visited, to prove you had been there. In particularly scandalous cases you might also be expected to undertake the pilgrimage barefoot or even naked! when a man has sinned openly, of which sin the fame is openly spoken in the country... Common penance is that priests enjoin men commonly in certain cases, as for to go, peradventure, naked in pilgrimages or barefoot. For many pilgrims their motivation was very personal and completely voluntary. They might still be motivated by the need to do a penance, but the sin committed might be something only God would know about. The people would also go on pilgrimages to attain better health, for themselves or for their loved ones; for protection from enemies or to honour a vow. They wandered with the strong conviction that the relics or pictures of the saints kept at the place of miracle, would guarantee the presence of the saint itself. Pilgrims believed that the saints would perform miracles and cure diseases. They would pray to God or to a saint, promising that if the sick person recovered, they would make a pilgrimage to the grave of the saint afterwards to honour the vow, in praise. You could even go on pilgrimage to release a dead person from purgatory. Eventually the pilgrimages became more regulated, connected to and motivated by the idea of the indulgence. According to this notion, the church held a treasury of extra 'merits' because Jesus and the saints had done so many good deeds. These extra merits would be given to whoever underwent a pilgrimage to a certain destination. The sins of the pilgrim could be forgiven to whatever extent the church desired. The pilgrims might hope to save their souls from eternal damnation in Hell or shorten or entirely escape purgatory. One general belief was that if you undertook a pilgrimage to the grave of St. James the Apostle in Santiago, your time in purgatory would be halved. In the 12th century, Gerald of Wales undertook a pilgrimage to Rome and rushed around as many sites as possible, to accumulate as many indulgences as he could. Having calculated that he had collected 92 years of indulgences, he undertook another religious act in order to round-up his indulgences to 100 years! By the 14th century indulgences became a serious problem, as each holy site competed to attract pilgrims by offering a greater indulgence than a rival site. Some sites were offering hundreds or even thousands of years of indulgences. This was one of the major causes of the decline in the number of long distance pilgrimages. Another cause of decline of Pilgrimage was the appearance of professional pilgrims. In the case of illness or old age, it had always been possible to have somebody do the pilgrimage for you. These are called vicarious pilgrimages. Roger the clerk was too ill to travel to Canterbury, so he sent his candle instead. As soon as his candle was lit, he recovered. Eventually, it became possible for anyone to pay for a pilgrimage to be done and as consequence 'professional pilgrims' began to appear. At the Baltic port of Lübeck, a group of professional pilgrims would compete to be your Jerusalem pilgrim with fees ranging from 20 to 100 marks. (iii) A sort medieval tourism - 'been there, done that'. 'Let no man go to the Holy Land just to see the world. Or simply to boast "I have been there" and "I have seen that", and so win the admiration of his friends'. Santo Brasca 15th century pilgrim. 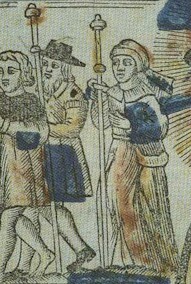 For reasons of safety, Pilgrims tended to do the journey in groups. As well as providing opportunities to make new friends, it also meant there were plenty of parties or 'making merry'. If travelling to the Holy Land by sea, the travel merchants of Venice could offer you a complete package tour including travel, food, accommodation and guided tours of Jerusalem and special excursions to the river Jordan. Indeed, on arrival at the destination, pilgrims would often encounter a scene not too dissimilar to the modern day package holiday. Chances are they would be met on the roads outside the town by boys sent by hotel owners and innkeepers offering accommodation. Advertising billboards for accommodation could be found in surrounding villages, often many miles from the final destination. Sometimes the innkeepers went too far. In 1205 in Toulouse, France, the authorities had to warn the hotel owners to stop physically dragging pilgrims in off the street! There were tourist guidebooks to read, such as the famous 'Mirabilia Urbis Romae' which listed and described the 'wonderful' sites of Rome that the visitor might like to explore. If you had the money, then you might hire your own local guide and translator. At the sanctuary itself, particularly the famous ones, pilgrims would be met by a large noisy crowd. In a city like Trondheim, where many pilgrims wandered to visit the grave of St. Olav, there were many people making money from the pilgrims. Amongst the fellow pilgrims, there would be buskers and entertainers, market stalls and pickpockets, beggars and prostitutes. There were primitive postcards and souvenir pilgrim-badges to buy from licensed traders. Pilgrims showed particular interest in the exotic products, spices, wines and silks, not available at home. Many pilgrims also indulged in a little bit of 'duty free', hiding their purchases from the customs men or bribing the appropriate officials to turn a blind eye. Inside the sanctuary, things were little quieter. As the day progressed, crowds grew and the wine flowed freely. At Santiago de Compostella, the priests despaired that 'all sorts of noises and languages can be heard together, discordant shouts, barbarous singing in German, English, Greek and every other language under the sun'. (Sumption: 213) The behaviour was such that many sanctuaries, such as Durham in England, employed the equivalent of 'bouncers' to keep order and eject those who behaviour was considered too 'rude'. Some pilgrims even decided to leave their mark by carving their name or their family coat of arms in the sanctuary itself. Ghillebert de Lannoy's graffiti at Mount Sinai, can still be seen today.